For Sophie, small-town life has never felt small. She has the Yum Yum Shoppe, with its famous fourteen flavours of ice cream; her beloved marching band, the pride and joy of Acadia High (even if the football team disagrees); and her four best friends, loving and infuriating, wonderfully weird and all she could ever ask for. Plot (A): I honestly have no idea how to describe the plot of Famous In A Small Town without just smushing my cheeks and dying of happiness lol! Seriously, the book was soooooo good! Like the synopsis actually does not do the book justice because wow is Sophie’s summer one kind of an adventure! There is a little of a lot of mystery which I adoreddddd and it’s ending was one I didn’t see coming because I was honestly too wrapped up in my cinnamon roll of characters (tho some of them are not cinnamon rolls on the outside lol) I know I’m being vague but I don’t want to spoil you guys and it’s actually so much more fun to just read this and become a part of a small town again and just enjoy life with Sophie and the gang. You will most definitely love being with them! Characters (A+): Like I just said, you will enjoy life with Sophie and the gang in FIAST and that’s because they are so absolutely amazingly written! All of the main characters felt like real, authentic people with thoughts and feelings and actions that felt so much like them. Like even if Emma Mills had written a book with 10 characters doing the exact same actions, it would feel like they were all doing something different and processing the experience different, just like in real life, and I appreciated that so much. It honestly felt like I was a part of each of the characters seeing just as much as they would allow me to see at any point of time and seeing more or less of them as the situation called for it. It felt appropriately mysterious and vulnerable at the same time. I loved all of it so much and I wish I could hang out with these characters for even longer because I loved em so much! Overall, Famous In A Small Town* was so wonderful! I loved every second of reading it and I hope you guys will love it too! 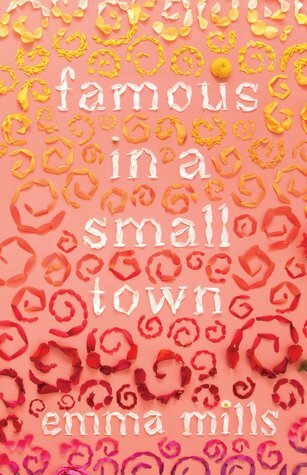 Now, have you guys read Famous In A Small Town yet? If so, what did you think of it? Let me know in the comments below! Thanks, have a great day/night and tata for now!